WASHINGTON (AP) – Black high school graduates are less ready to succeed in college or a career than whites or other minorities, according to the latest ACT annual report of test results. Just a quarter of this year's high school graduates who took the ACT tests have the reading, math, English and science skills they need to succeed in college or a career, according to data the testing company released Wednesday. The numbers are even worse for black high school graduates: Only 5 percent are fully ready for life after high school. The results, part of ACT's annual report, indicate thousands of students graduate from high schools without the knowledge necessary for the next steps in life. The data also show a downturn in overall student scores, although company officials attribute the slide to updated standards and more students taking the exams - including those with no intention of attending two- or four-year colleges. "The readiness of students leaves a lot to be desired," said Jon Erickson, president of the Iowa-based company's education division. 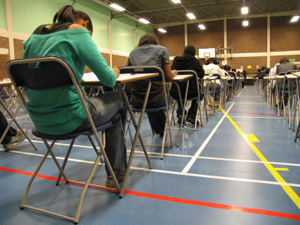 The ACT report is based on the 54 percent of high school graduates this year who took the exams. Roughly the same percentage took the SAT - the other major college entrance exam - and many students took both tests. Those who took only the SAT were not included in the report. Under ACT's definition, a young adult is ready to start college or trade school if he or she has the knowledge to succeed without taking remedial courses. Success is defined as the student's having a 75 percent chance of earning a C grade and a 50 percent chance of earning a B, based on results on each of the four ACT subject areas, which are measured on a scale from 1 to 36 points. Of all ACT-tested high school graduates this year, 64 percent met the English benchmark of 18 points. In both reading and math, 44 percent of students met the readiness threshold of 22 points. In science, 36 percent scored well enough to be considered ready for a college biology course, or 23 points. Only 26 percent of students met the benchmarks for all four sections of the ACT test. About 69 percent of test takers met at least one of the four subject-area standards. That means 31 percent of all high school graduates who took the ACT were not ready for college coursework requiring English, reading, math or science skills. Of the 1.7 million students who took the 215-question ACT exam, as many as 290,000 were within 2 points of meeting at least one of the four the readiness thresholds. "There is a group that's on the fence," Erickson said in an interview with The Associated Press ahead of his company's release of the report. "With a little further instruction or motivation, perhaps some additional remediation or refreshing some of their past skills, they may be able to achieve that benchmark." Erickson said the lower-performing students often attend the worst schools. Students from all racial backgrounds did best in English and worst in science. Some states and school districts have begun requiring more students to take the tests. About 22 percent more students took the ACT test in 2013 than in 2009. In the past four years, ACT has increased its share of the test market, climbing from 45 percent of high school graduates in 2009 to 54 percent this year. ACT said it updated its benchmarks for success in reading and science this year to better reflect what students need to know. The percentage of students with reading skills needed to succeed after graduation slid from 53 in 2009 to 44 last year, while science readiness scores climbed from 28 percent in 2009 to 36 percent last year. Both differences may have been caused in part by changes in the benchmarks. In other subjects without changes in the benchmarks, students' readiness scores have declined. In English, scores slid from 67 percent in 2009 to 64 percent last year. And in math, scores increased slightly, from 42 percent in 2009 to 44 percent this year.